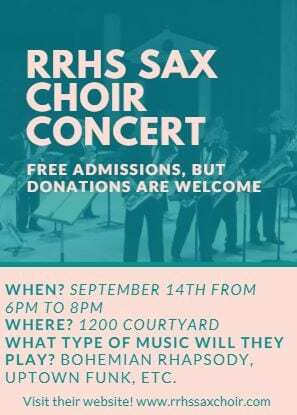 On September 14th, this Friday, from 6pm to 8pm in the 1200 Courtyard, RRHS Saxophone Choir is having their 1st EVER concert! They will be playing music like Bohemian Rhapsody, Uptown Funk, different Disney music, and more! It is free to attend, but donations are very appreciated! We can’t wait to see you all there! Check out their website: rrhssaxchoir.com and find more about their cause!